The TERMIS-EU 2019 meeting is to be held from the 27th to the 31st of May 2019 in Rhodes, Greece. The theme of the meeting is ‘Tissue Engineering Therapies: From concept to clinical translation and commercialisation’. The programme of the TERMIS EU 2019 will include specific workshops and symposia in tissue engineering and regenerative medicine tools, technologies and discoveries; clinical trials; regulatory approval of new devices; scaling up; commercialisation; career development of young investigators; women leadership and representation; education; and outreach. Standard registration is open throughout February. Biomaterials Science is pleased to support the ‘New frontiers on biomaterials for bone regeneration‘ symposium at the 2017 Brazil MRS Meeting, which will take place from 10-14 September in Gramado, Brazil. The focus of this symposium is on advanced biomaterials for bone regeneration, including biomimetic materials or emerging metallic alloys, ceramics, natural and synthetic polymers, composites, and adhesives, as well as their interactions with proteins, blood, cells and mineral tissues. By gathering together clinicians, biologists, materials researchers, engineers and industrials, this symposium will highlight the most recent advances on biomaterials for bone regeneration. Register to attend now – click here to access the registration page or visit the website for more information. Biomaterials Science is proud to sponsor the PMSE Symposium: Synthesis, Self-Assembly & Applications of Peptides & Polypeptides, at this year’s ACS Fall meeting. The conference, which will take place from 20-24 August in Washington, DC, offers scientific professionals a legitimate platform to present, publish, discuss and exhibit the most exciting research discoveries and technologies in chemistry and its related disciplines, as well as providing them a greater understanding of the role chemistry plays in the global economy, health, safety, and the environment. Registration is now open – click here to register now and take a look at the programme overview. We are pleased to announce the Biomaterials for Tissue Regeneration symposium which will take place at the 25th International Materials Research Congress in Cancun, Mexico. The symposium, endorsed by Biomaterials Science and held from 20-25 August, will gather together clinicians, biologists, materials researchers, engineers and industrialists to highlight the most recent advances on the interactions of biomaterials with cells and tissues. The focus of the symposium is on the most novel knowledge on the cross-talking between biomaterials and biological systems, i.e how biomaterials, including biomimetic materials or emerging metallic alloys, ceramics, natural and synthetic polymers, composites, and adhesives, interact with proteins, blood, cells and mineral tissues in order to provide tissue regeneration. Early bird registration ends on 31 May – click here to register now or visit the IMRC website for more information. This year, the UK Society for Biomaterials Annual Conference will take place at Loughborough University from 20-21 June, and will be aiming to showcase leading research in all areas of biomaterials with a focus on the development of next generation scientists. Various postgraduate prizes and research awards will also be presented at the conference. Closing date for abstracts is 30 April – submit here now. Osaka, Japan will host this year’s Nano Delivery 2017, International Conference and Exhibition on Nanomedicine and Drug Delivery. Nano Delivery 2017 will serve as a platform for the interaction between experts in the areas of nanotechnology, nanomedicine, pharmaceutics and drug delivery around the world and aims in sharing some unique research and translational studies on various advances in the field of Nanomedicine and Drug Delivery Technologies. The main theme of the conference is designated as “Challenges and Innovations in Nanomedicine and Drug Delivery Research”, which opens the doors for many researchers, clinicians, and industry representatives working in these exciting areas. Over 50+ international organizations will be exhibiting at the Nanodelivery 2017 conference and exhibition. Exhibitors will include equipment manufacturers and suppliers, systems providers, finance and investment firms, R&D companies, project developers, trade associations, and government agencies. In addition to the Nanodelivery exhibition, there will be keynote presentations, product demonstrations, educational sessions from today’s industry leaders, and poster presentations. You can view the full schedule and list of speakers on the website and register to attend here. The EMBO Conference for Advances in Stem Cells and Regenerative Medicine will take place this May at the EMBL in Heidelberg, Germany, and will aim to provide a comprehensive overview of the various aspects of stem cell biology. The cellular and molecular properties of normal tissue stem cells will be discussed, as will the properties of the niches that maintain them. The conference will address alterations to stem cell function during ageing, and how stem cells can be used for regenerative purposes and for disease modelling. On this occasion a particular focus will be on ageing/metabolism and the link between these topics and tissue homeostasis/regeneration. These are emerging areas in the stem cell field, with considerable potential and huge societal relevance. The meeting will also focus on the emerging and state-of-the-art single cell transcriptome techniques that are uncovering novel insights into stem cell populations. The full programme and other details are available on the website and registration is open until 12th April. Biomaterials Science is pleased to support the 6th China-Europe Symposium on Biomaterials in Regenerative Medicine, which takes place at the Fundação Dr. António Cupertino de Miranda. CESB2017 aims to bring together two societies that have collaborated for many years to promote significant advances to the field of biomaterials, with specific focus on regenerative medicine applications. It will review the developmental trend and the progress on the frontier research of biomaterials sciences and engineering, including progresses in clinical research and applications. To view the complete programme and list of speakers please visit the website. Registration ends on 1 May 2017 – click here to register now. Registration is open – book before 15th February 2017! The Scandinavian Society for Biomaterials (ScSB) was founded in May 2008 and focuses on organizing an annual Biomaterials meeting in Scandinavia and the Baltic states, to promote discussions and exchanges on Biomaterials research between academics and scholars, but also students and industry. The ScSB 2017 meeting will tackle the underlying challenges in the fields of biomaterials and tissue engineering. Some focus will be made on fundamental inssues in biomaterial science. The conference will offer a platform for networking and socialising with Nordic and international scientist in a relaxed atmosphere. One of the main aims of this meeting is to create an environment for students and young investigators to interact with more experienced scientist and to spawn fruitful discussion between them. Some time to enjoy the delightful scenery will also be made to ensure that minds and bodies alike are kept in focus. 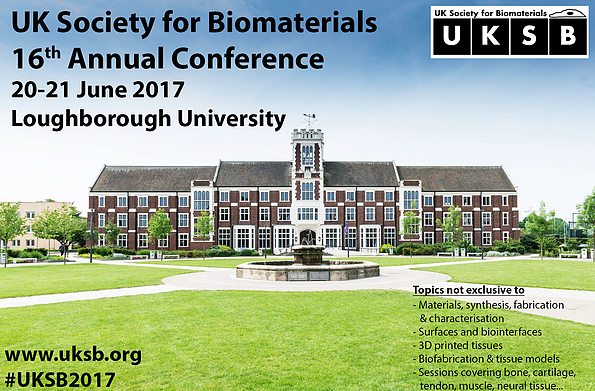 Biomaterials Science proudly sponsors this event: one oral presentation prize and two poster presentation prizes will be delivered.